Planar Systems, Inc. announced that the developers of PARAMOUNT Miami Worldcenter, have chosen Planar’s Clarity Matrix LCD Video Wall System to help market the luxury condominiums to future buyers. The PARAMOUNT Miami Worldcenter residential tower is set to rise above the heart of downtown Miami’s 30-acre mixed-use project, Miami Worldcenter. 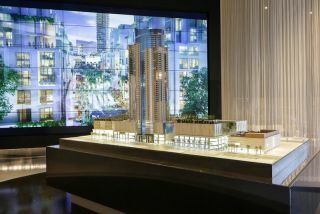 To help sell condominiums in the 706-foot tower, the developers have combined 36 Clarity Matrix LCD video wall displays into a 323 square-foot digital video wall that serves as the focal point of its sales gallery. The video wall presents potential buyers with floor plans, images and high-definition video. •Turnkey solution: With a single order, iHummingbird received all the components for the video wall, eliminating the cost and reliability concerns of using third-party equipment. •Light-weight installation: Each 55-inch Clarity Matrix LCD video wall display weighs approximately 60 pounds, making the video wall solution more cost-effective to mount than competing products on the market, which would have required a heavier and more expensive mounting infrastructure. •Quick and precise installation: To install the Clarity Matrix video wall, iHummingbird used Planar EasyAxis Mounting System, which facilitated the quick and precise alignment of all Clarity Matrix displays that make up the video wall. The mounting system ensures all displays with a Clarity Matrix video wall are perfectly aligned and provide the thinnest footprint of any LCD video wall solution. •24x7 reliability: Clarity Matrix LCD video walls feature a unique off-board electronics design that allows for power supplies and other components to be located remotely. This keeps heat-generating elements away from the video wall, minimizing the potential for heat-induced failures. •Ultra-narrow bezels: Clarity Matrix LCD video walls utilize cutting-edge ultra-narrow bezels, reducing the gaps between displays and making the video wall look like one contiguous image. The Clarity Matrix LCD video walls are available in 46-inch and 55-inch sizes. Models are also available with multi-touch interactivity and 3D technology.